In the UTV world, it seems like everything is getting bigger. Chassis, engines and tires are all getting into the realm of pickup-truck sizes. The tire companies are loving the growth, especially in the Southeast and West where they believe bigger is better. Fuel Off-Road, one of the largest aftermarket wheel (and now tire) companies, has a huge catalog of products to outfit any UTV, big or small. 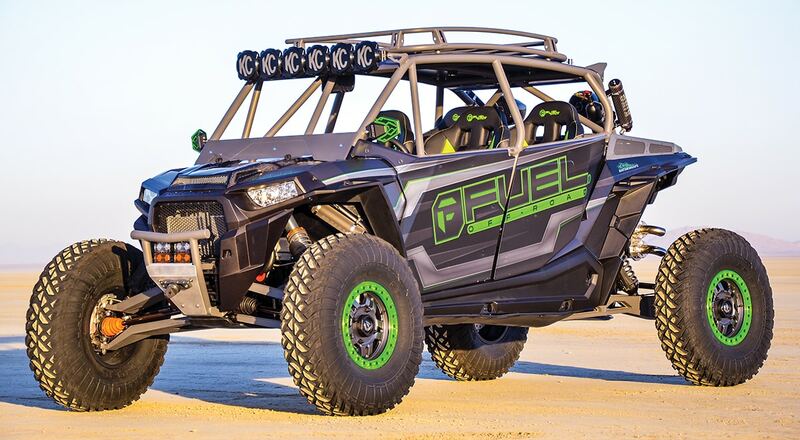 To test and showcase Fuel’s largest UTV-specific meats, brand manager Ryan O’Hara has built a giant four-seat Polaris XP Turbo. It’s designed for the weekend trips he takes with his family. The rig was built not only to conquer but for comfort, too, and is equipped with the best amenities in the industry. Trinity, RCV and HCR all contributed their best equipment for this build. It drove as good as it looked. The samples Ryan chose to install on this build are the Gripper T/R/K 35×10-15s, Fuel’s largest tires sold specifically for UTVs. They are DOT approved and offer steel-belted radial construction. Both of those features make the tires strong and super smooth on hard surfaces and at higher speeds. The meats have a rounded profile with deep lug and traction ribs that wrap halfway down the sidewall, providing additional puncture protection. Each tire is wrapped around a 15-inch, cast-aluminum beadlock wheel. These Anza dubs have a patented design and come with a Matte finish. They were attached to the stock hubs using an ARB wheel stud kit. 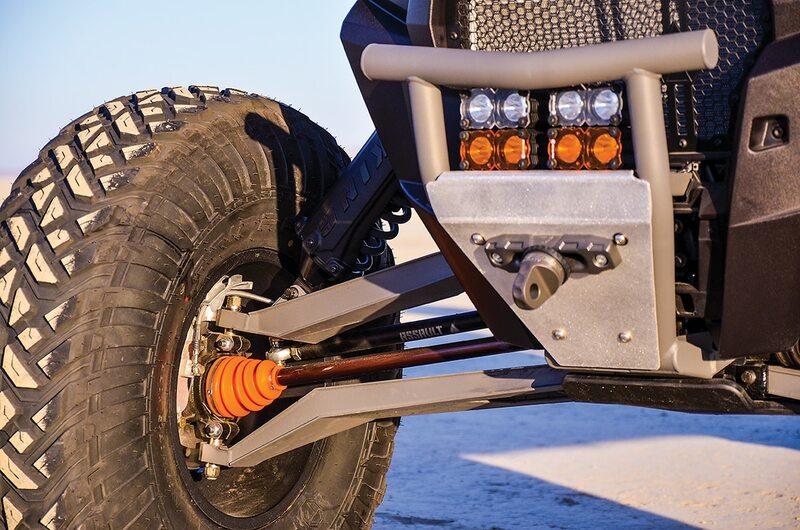 HCR’s Dual Sport suspension looked strong and held on to the massive tires well. The four new Simpson TS-R heated seats might just be the most comfortable seats in the house on winter riding trips. Simpson’s Lock and Latch five-point harnesses will keep everyone buckled in. Overhead, a Madigan Motorsports roof rack offers more storage, while the full cage, doors, trunk and rear wing provide additional protection and define the look of this car. 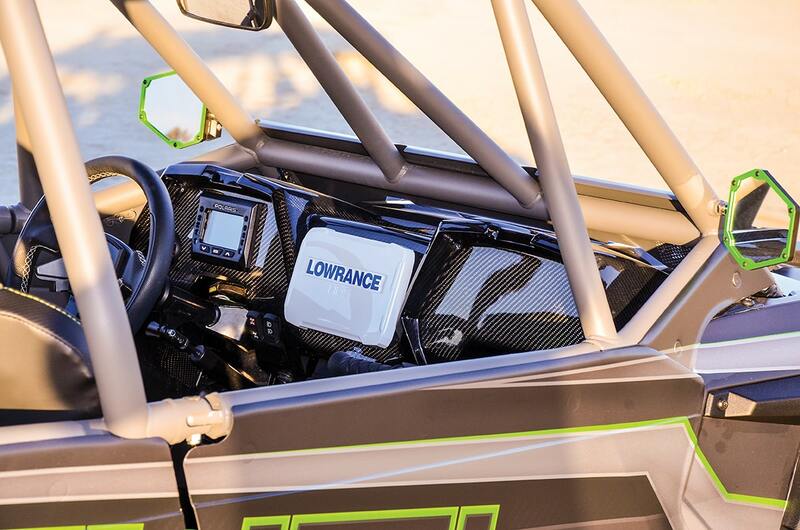 More cool components include a GlassKraft carbon fiber dash, featuring an XTC six-switch power control system and an HDS-7, Lowrance GPS system preloaded with every trail in the western U.S. from PCI. Also inside the cockpit, we found a Rockford Fosgate Stage 4 stereo system that could be heard a mile away. 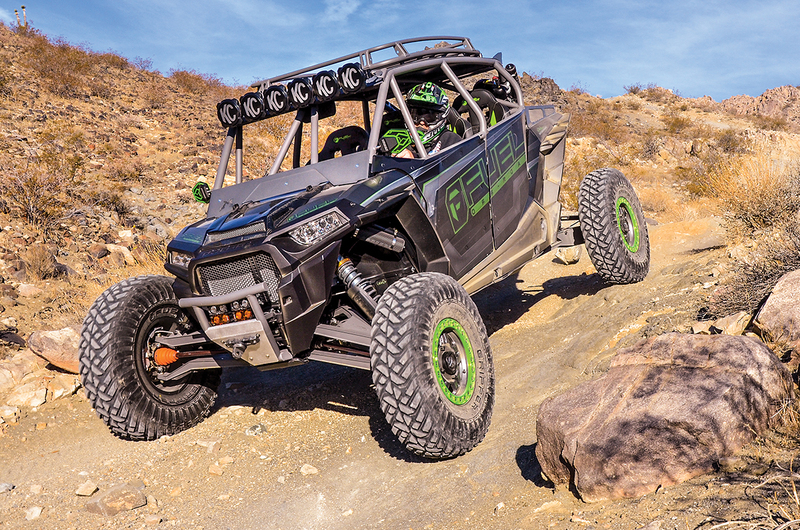 With a few tuning mods, the big RZR was still as quick and sporty-feeling as a stocker. Assault Industries provided some of its best equipment for this build. That list starts with the Hellfire grill upfront, a pair of B2 Bomber mirrors on the A-Pillars, a Tomahawk steering wheel mounted to a quick-release hub, and the list finishes off with a quick-release fire-extinguisher kit in the back. Under the entire length of the stock Polaris frame, Ryan installed a 1/2-inch-thick UHMW skid plate and rock sliders from Factory UTV. Up top and on the front bumper, KC Highlights Gravity and C Flex LED lights help extend the riding day into the wee hours of the night. The clean wing with integrated chase lights and the slim cargo rack are products of Madigan Motorsports. That four-seat cabin sits on top of HCR’s complete dual-sport A-arm and trailing-arm package. The shocks have also been replaced with King’s internal bypass shocks that feature finned remote reservoirs. Before the suspension was bolted on using an ARP bolt kit, Ryan welded in HCR’s frame braces in the front and used Assault tie rods attached to a Shock Therapy billet racing steering rack. Assault radius rods were installed out back. All four stock axles were upgraded with longer, stronger RCVs, adding to a beefier drivetrain that also features a Sandcraft Gen 3 carrier bearing. Like the rest of the car, the Glazzkraft dash is a work of art. 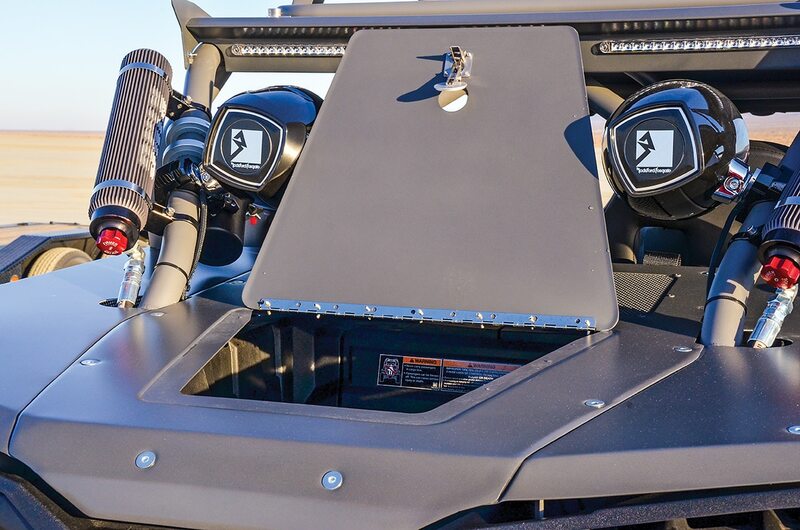 Staring at it from the driver’s seat makes you feel like you are in something other than a RZR. 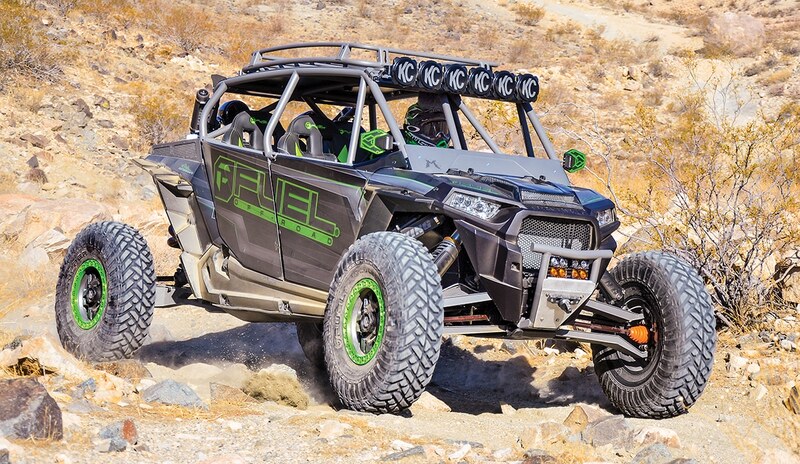 To keep the exciting, turbocharged feeling of a stock XP Turbo, Ryan had to overcome the weight and traction gains of the massive 35-inch tires and long-travel suspension by lowering the gearing in the transmission. While he was in there, he had CryoHeat do its full micro-polishing treatment. In the engine compartment, EVO Powersports re-flashed the ECU and added a stronger intake boot and charge tube with a new cool-sounding blow-off valve. For the ignition side, he installed an EnergyCoil coil system, and for the exhaust he chose a Trinity Stage 5 complete system. Simpson’s heated seats were a nice touch for cold winter rides. 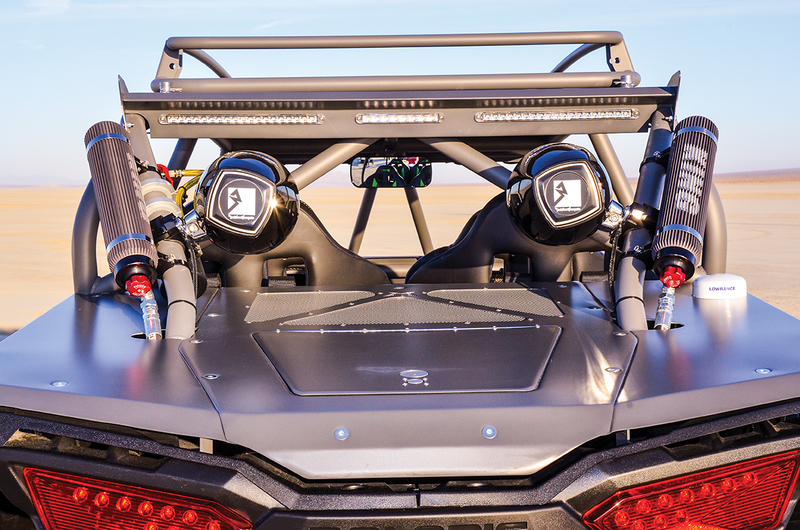 When we climbed into the cockpit, the car reminded us of the new RZR Turbo S. Due to the longer HCR arms and 35-inch tires, the car sits taller with tons of ground clearance. The Simpson seats are super comfortable, and having the option to turn the heaters on is perfect for those cold winter days. 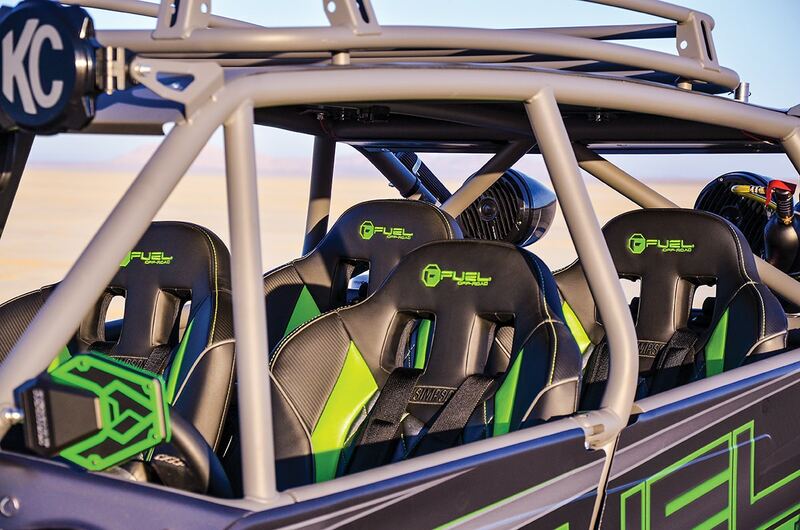 The entire cockpit feels updated and doesn’t even remind us of an RZR. From the cool Assault steering wheel to the carbon fiber dash and huge GPS, it reminds us more of a Trophy Truck than anything else. Usually long-travel and larger tires put a strain on the engine and the car feels slower. This car has ECU tuning and matched transmission gears, so the car runs even better than stock. It accelerates hard without squatting, so it’s not slow in a drag race; however, if the trail demands slow going for rocky or technical sections, it feels at home doing that too. As on the Turbo S, the brakes were a little spongy at first. Since this test, Ryan has installed the Streamline 270mm oversized rotor kit and Streamline pads. Covered cargo areas are nice if you don’t plan on carrying a spare tire and want to keep smaller items tucked away. With how well these Fuel Gripper tires worked, the lack of a spare was a non-issue. 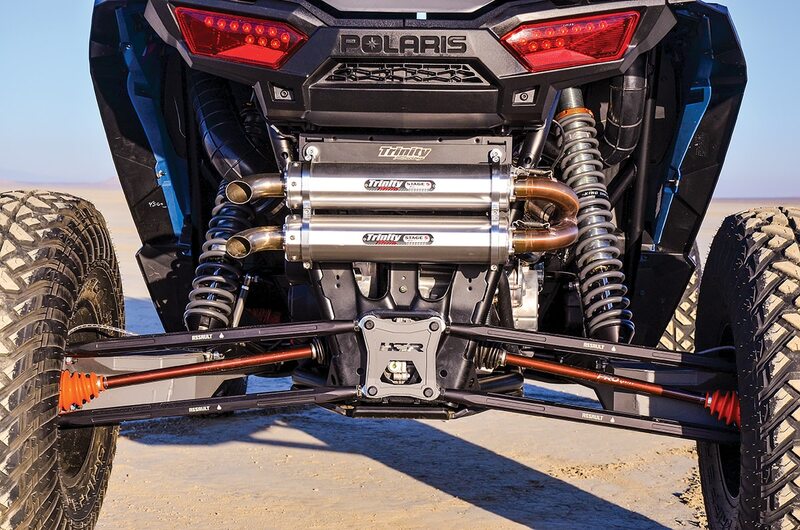 The Fuel Polaris RZR is not only one of the most trail-ready RZRs we have driven, the 35-inch tires, heated seats and high-end suspension make it one of the largest full-functioning RZRs built. It hauls the mail across the open desert while still crawling up gnarly rock sections that would make a stock Jeep retreat back to the mall parking lot. While this machine was built for weekend family fun, it can take a whole lot more. If you are ready to put together a beast built for anything, this car should be your template.